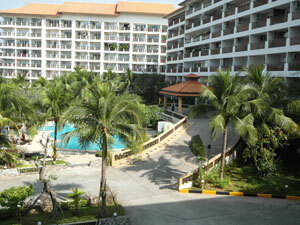 The Royal Hill Condo Jomtien is in a fantastic location with ocean views and close to Pattaya Water Park. Very easy transportation to Jomtien beach and Walking Street. Royal Hill is in an exclusive region of Pattaya surrounded by the best restaurants that Pattaya has to offer including Bruno,s, Manhattan, Mata Hari, Indian by Nature, News Cafe and more. 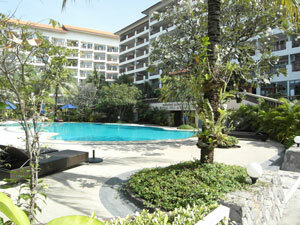 The Royal Hill Spa & Resort Pattaya has a nice large swimming pool and fitness center. 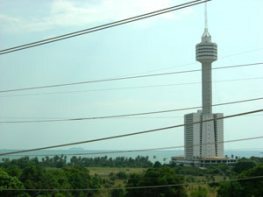 All condos available have ocean view and are across from the Pattaya water park & tower. Transportation is easy to Jomtien and Pattaya. Click here for a Google Map and the location of Royal Hill Condo Jomtien. Large swimming pool, new fitness center, sauna, steam room restaurant, spa with 3 interior swimming pools, mini mart, laundry service, 24 hour security with keycard system. 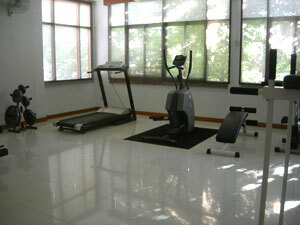 Rent: 80,000 - 120,000 Thai Baht per month, depending on season and length of stay. Features: European kitchen fully fitted out, hand made teak wood furniture, 4 air cons, 4 ceiling fans, home theater with surround sound, 1 additional TV and DVD, high speed internet. Rent: Short and long term rental available from 60,000 - 90,000 Baht a month depending on season and length of stay. Meer & Poolblick, sehr grosser Balkon, komplett ausgestattete Europäische Küche, Flachbildschirm LCDs & DVD-Spieler, Klimaanlagen & Deckenventilatoren, 4 Zimmerwohnung, 2 Badezimmer, komplett möbliert. Miete: 75 - 105,000 pro Monat. Je nach Saison & Aufenthaltsdauer.